el paso daily photo blog by chacal la chaise: Yesterday was a fine day for touring on Shadow Mountain Drive. Yesterday was a fine day for touring on Shadow Mountain Drive. It isn't often I get the opportunity or the time to drive-by shoot images these days. Yet this drive-by was too good to pass up. 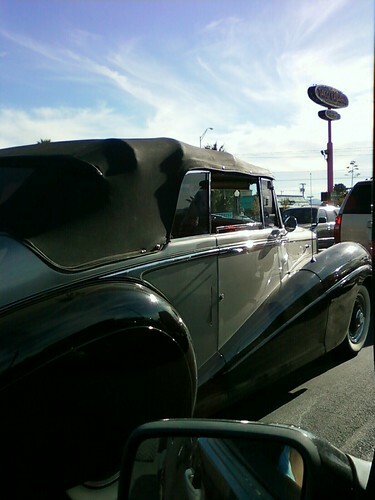 On the way to class, I caught up to this antique Bentley (possibly from the mid- to late- 1930s) near Mesa Street on Shadow Mountain Drive. I photographed two images while we were stopped at the light. We started up again and It turned left, as did I. Although I tried to get another shot of the beast from my rear view door mirror, I soon lost it in traffic. I've always thought Bentley's were supposed to be too "cool" for a hood ornament. I also heard a Bentley was a Rolls-Royce without the hood ornament. (These are myths because in the case of this beauty, it had the Bentley marque on the rear near the license and a winged "B ornament on the bonnet. In any case, it was a delight to see on such a beautiful day.